When Xu Sheng damages a player with an attack, he can flip their character card and they draw X cards, X is how much health they have after the damage. When Xu Sheng damages characters who are Chained with a Fire or Lightning Attack, he can choose to force any or all damaged characters to flip and draw X cards. The 'X' number in Xu Sheng's "Broken Arms" has a maximum of five. For example, if Xu Sheng successfully Attacks Dong Zhuo with seven units of health remaining afterwards, Dong Zhuo only draws five cards, not seven. "Broken Arms" is incredibly powerful against characters who are low on health. If Xu Sheng is able to successfully Attack a particular character on each of his turns, they will draw fewer and fewer cards each time (since X, the number of units of health remaining decreases as they take damage from each Attack). If they do not draw Escapes, it can be difficult for them to break this cycle that will eventually lead to their death. "Broken Arms" can also be helpful if Xu Sheng's team is weak. Even if Xu Sheng chooses to flip a character with a lot of health (and they draw a lot of cards), the skipped turn may give his teammates time to recover if they draw the right cards. Some characters have abilities in which they must flip their character card. Because the 'flip' game mechanism is toggled (and a flipped character flips back face up), Xu Sheng can help these characters take their next turn by simply Attacking them. Xu Sheng's only ability, "Broken Arms," depends on him being able to reach and Attack his enemies. If Xu Sheng does not have an Attack card or if he cannot reach enemies he wants to flip, he will not find his power very useful. Xu Sheng's "Broken Arms" usually work well on characters with many units of health. Remember, a turn, like a unit of health, is approximately worth two units of health. Experienced enemy players will fear Xu Sheng and will save their Escapes for Xu Sheng. As a result, believing that opponents that take damage from other characters' Attack have no Escapes is a faulty assumption. Cao Ren/SP Cao Ren/SP Diao Chan/Demigod Lu Bu - These characters have abilities that force them to flip their character cards. If Xu Sheng Attacks them, he can flip them back face up and allow them to take their next turn. Demigod Zhuge Liang - If Demigod Zhuge Liang is protecting other characters with "Heavy Fog," the ability lasts until his next action phase. Xu Sheng can extend the effects of this protection by Attacking and flipping Demigod Zhuge Liang. 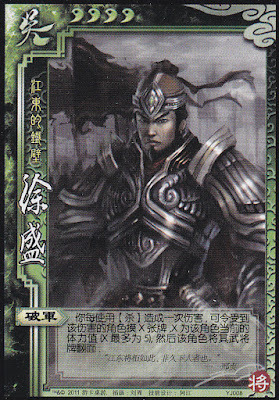 Dong Zhuo/Hua Xiong - These characters have many units of health and Xu Sheng can flip them and allow them to draw many cards. Gan Ning/Zhang Liao/Zhang He/Lu Su - These characters specialize in card destruction. This can be very useful before or after Xu Sheng uses "Broken Arms" to either make the technique more likely to succeed or to destroy the cards that the victim draws as a result of this power. Cao Pi - Cao Pi's "Exile" gives Xu Sheng competition when it comes to flipping players. If Cao Pi becomes damaged, he can flip face up a character that Xu Sheng flipped face down. Cao Zhi - Cao Zhi's "Wine Poems" allows him to flip face up if he is damaged when he is flipped face down. This mitigates the advantage that Xu Sheng gains when using "Broken Arms" on him. King Xu Sheng is an outstanding warrior, but not a good king. "Broken Arms" is not a good defensive ability. Loyalist Xu Sheng can be a great loyalist. With "Broken Arms," he can keep a rebel pinned down while the king and other loyalists pummel them. Rebel Xu Sheng is a great rebel. If he can pin the king down with "Broken Arms," the king can quickly find himself on the brink of death. Spy Xu Sheng is a mediocre spy. While "Broken Arms" can be a nasty surprise for an unexpecting loyalist, this power may be too extreme to use to keep the game evenly balanced. Any SGS player who has been on the wrong side of Xu Sheng's Attacks can testify for how brutal they are and how fearsome of a character Xu Sheng can be. Xu Sheng is particularly brutal against characters with a maximum health level of three, as they rarely have enough units of health to draw a substantial amount of cards from "Broken Arms." When planning on using this power on an enemy, try to weaken them by playing tool cards like Barbarians, Hail of Arrows, and Duel to reduce their current health level and reduce the number of cards that they will draw via the power.